For an exhibition about structural failings, this room of objects and images appears rather solid. 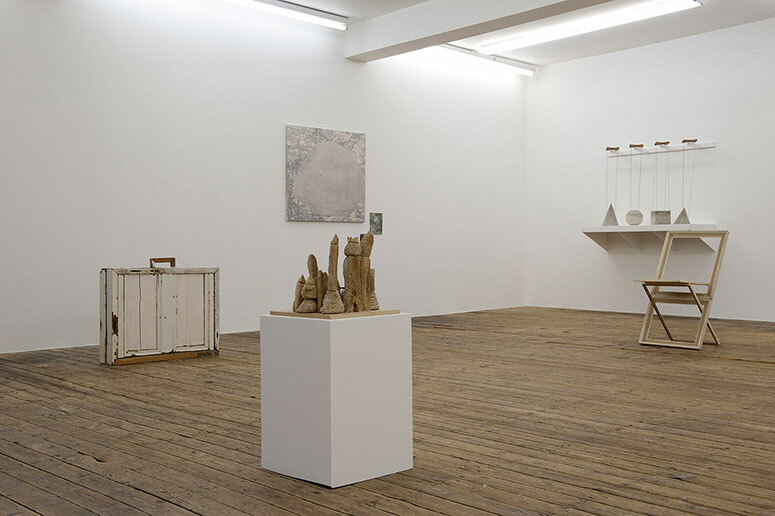 Firstly, because it’s a good, genuinely quirky summer group show, secondly, because it offers variably dynamic, as opposed to whimsically ephemeral, abstract painting’s ongoing fascination with the grid, sculptural repurposing of existing objects and the prop as conduit for human experience – yet there is nothing fashionable opaque about the production or the skewed logic of each endeavor. While Please Drive Slowly Through Our Village certainly rings with a sense of potential disregard for a local state of play, if there is a plea to this passing through, perhaps it is to consider the shift between a communal and an outside perspective. For however purposefully generic any form presented, or strong the art-object link with a particular visual vernacular o trope, the personal modes of customization present here invariably knock associations off any predictable course. The majority of works employ or recall everyday notions of human scale. An absurdist dynamic immediately surfaces in the works of three sculptors (Tom Dale, Matt Golden and Sean Parfitt). Dale’s umbrella frame threaded with human hair is a wonderfully ghoulish object – all wispy spider-legged defunction – a surreal and rather pinchy evocation of pain and pathos. Golden has made a briefcase and a folding chair out of a wooden door and antique picture frames, the splintered and shattered qualities of which undermine any real sense of structural validity; think Inspector Gadget meets object trouvé. Parfitt’s faux climbing wall, collapsed like a rubber-limbed drunk in one corner, wears its unstably positioned grips (kneaded blobs of Plasticine) like avant-garde accessories. The exhibition’s soup could be easily reduced to include these three and Dominic Beattie’s canvases, his Pop-style undoing of minimal painting’s hard-edged heroics well suited to the mix. In one illusory composition the grid has become a potato waffle, punctured improbably by a straight, grey length of something. The pithy nature of this group’s handling of form and function doesn’t do any favours for the subtle folkloric sensibilities of neighbouring works – positioning them, unfairly perhaps, as the straight-man in the joke. Annabel Elgar’s large-scale photo of a cabin interior, featuring a curious bread sculpture, appears more charmingly than eerily uncanny when viewed in tandem with the dough castle itself. Caught between the implied narrative and staging of the image, one is left questioning the validity of both. While curator Simon Willems’s narrative (about a German hermit who became unwittingly famous in death) is intriguing, the accompanying paintings appear the anecdotal visualisations of it. Angie Hicks, however, gets the municipal/cult, functional/obsolete object-balance just right. her slight yet violent slo-mo film, which describes the pretty, if meaningless, destruction of a useless object – a plaster cast of a clothes iron – gives gaseous form to the question: ‘What’s the point of art?’ It’s thought that continues to circulate the room like a silent but potentially deadly fart.